Well this is it, all done, the final post of this years 365. The end of my third year, in with the bricks now and ready for year four, yes I am going for it again. Its been fun, its a great record of what you have done and a fab thing to look back on, especially if you have children to see how they have grown and changed. 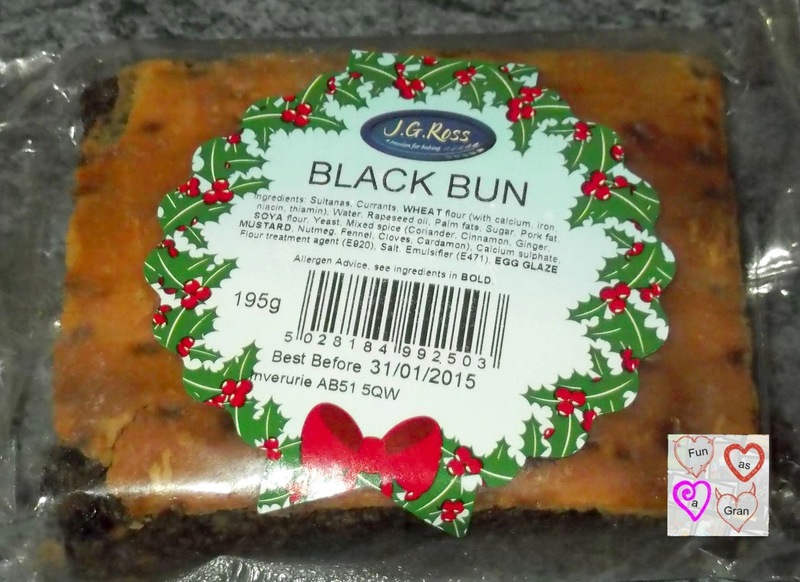 I have not had a piece of this in years. I remember as a teenager going to new year parties, back in the day you went door to door with a dozen friends and your own bottle, and every bodies door in the village was open till 6am, this was always on offer - along with many other starchy foods to soak up the alcohol. Always remember the amount of bread people use to buy to make up sandwiches for the visitors, the plates were mounted high. Was a day from hell. It rained and rained and rained, and rained a bit more. They were rescuing people by boat from a local supermarket, rescuing passengers from a train that ran into a five foot deep puddle, diverting traffic because the roads were closed with flooding. We still had food shopping to do, so we avoided Kilmarnock which seemed to have the worst of the weather and headed into Ayr. Just caught a news bulletin as we came out of the supermarket that one of the roads was shut due to an accident so managed to avoid going that way. The river was thirteen feet above seasonal norm, the highest it has been all year. 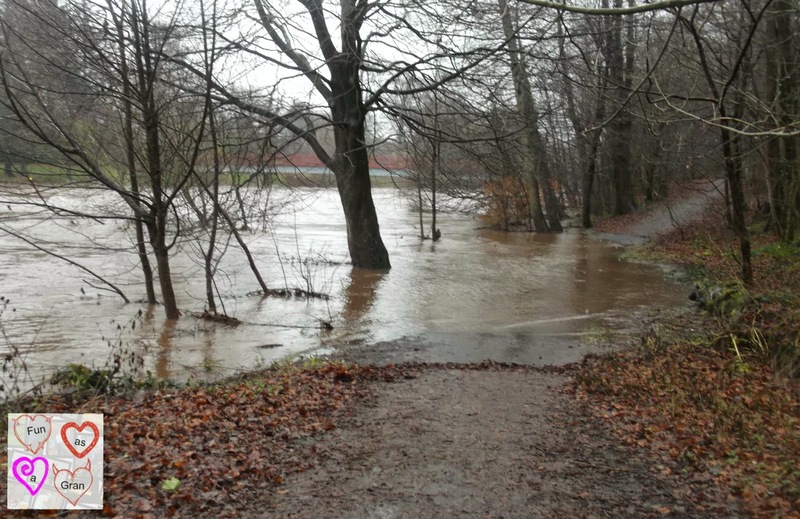 This was the park at the red bridge, the water was literally lapping the bottom of the bridge and spilling over onto the paths. I had the children over to stay today, did not think they would really want to come on Christmas night. We have a tradition where they make the snacks they leave out for Santa and the elves. 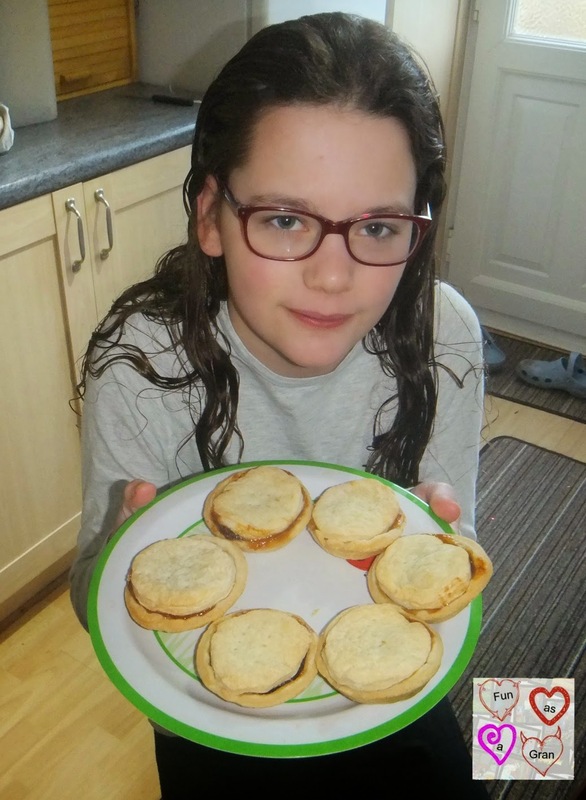 Fifi makes mince pies for Santa, and Bob allergy free biscuits for the elves. They love this little tradition so I always find time to do it. After tea they had some of their baking with hot chocolate and marshmallows in, Fifi also had squirty cream. I had discovered Sing along a Disney on youtube the other day and so I put this on for them. I remember buying this on video the year it came out as part of on No 2's Christmas and my lot loved it, it heralded bedtime on Christmas Eve as soon as it was finished. Nowadays these two track Santa on NORAD. You can read more about our traditions here. Last year I had smuggled the twins up the stairs and did a foot print painting that I made into a picture and laminated. So last week when I had them anyway I tried to get hand and feet prints off of both of them. Lottie was not amused and Xander was not too sure. So Daughter No3 and I just did foot prints instead. 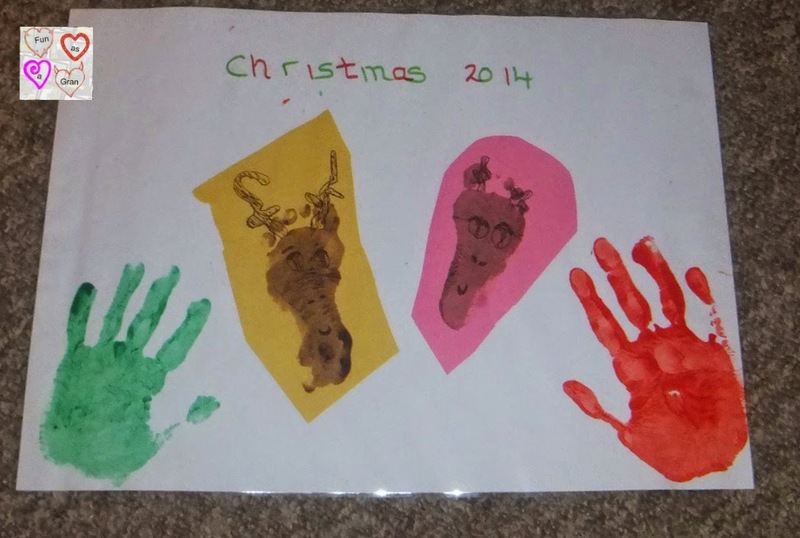 We made them into sort of reindeer and added hand prints from the other two to make into a Christmas reminder for everybody. Maybe next year they will oblige a bit better. Was a quiet start to the day for us. We had been invited down to daughter and Son in laws house to have Christmas Dinner with them all, along with the other grandparents. It was a fab day and nice to spend some quality time with everybody. Have to say I did not take a lot of pictures there was just too much going on. Have to sat the two wee ones got some beautiful clothes for Christmas from relatives. 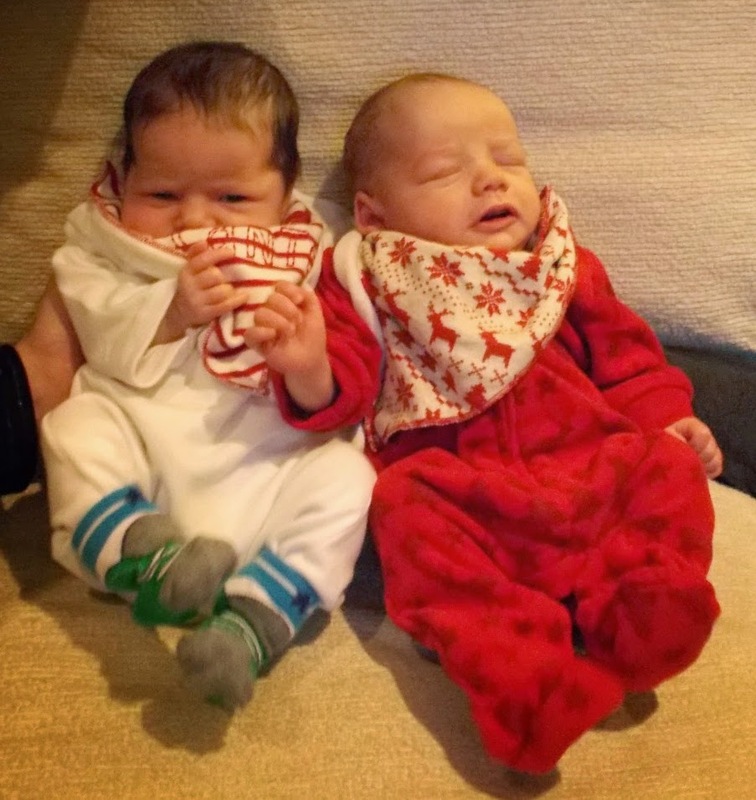 They had matching design outfits to wear for Christmas day. The older two got a huge variety of stuff as well, and as is typical of this modern generation - they got far too much stuff. 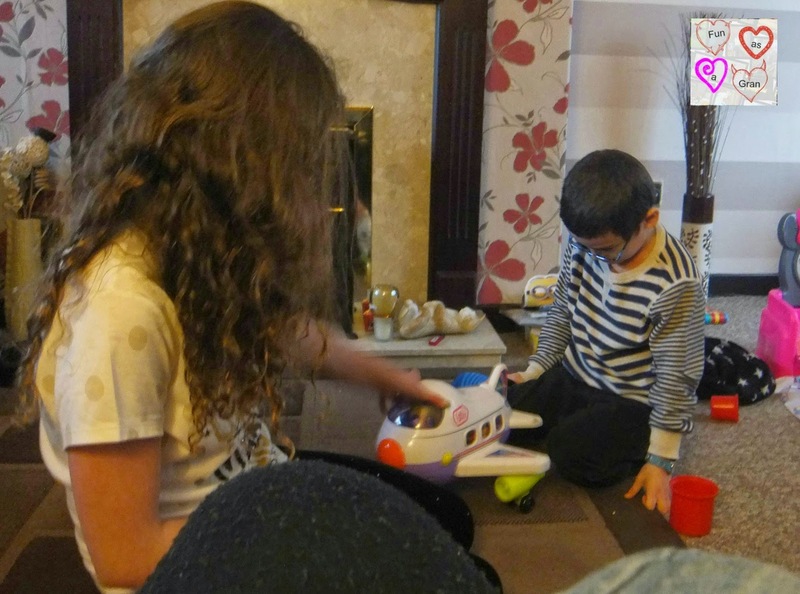 We made a decision a number of years ago that we would have the children over on Boxing Day and that they would receive presents from our side of the family then. Saves over whelming them too much all on the one day. 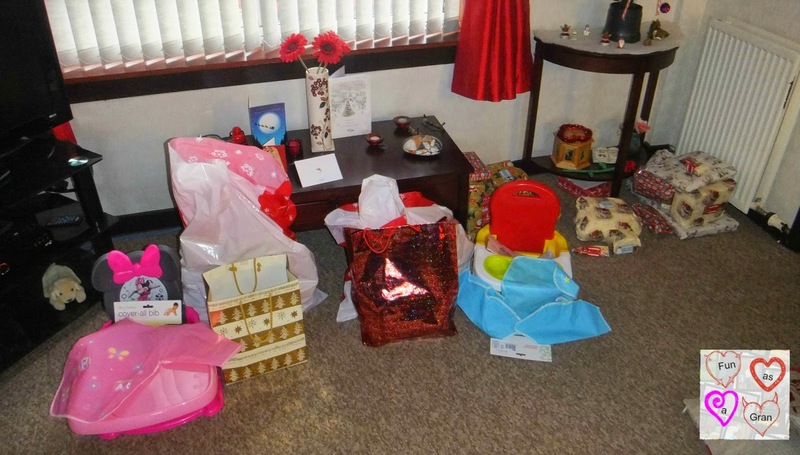 Sadly this year none of the other daughters could make it over but they had left presents here for them. The six of them came round and we had a nice few hours. 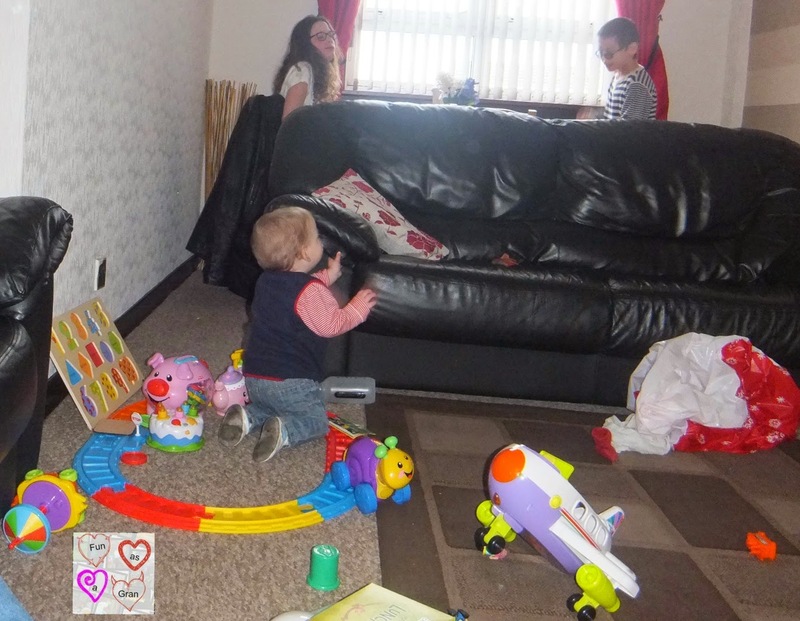 Mum and dad took the twins away and the older two stayed on and played with some stuff and watched a film before they went back home. Have to laugh at the older two - playing with the wee ones toys, Bob got a row for taking the stacking cups of off Minky so he could play with them. 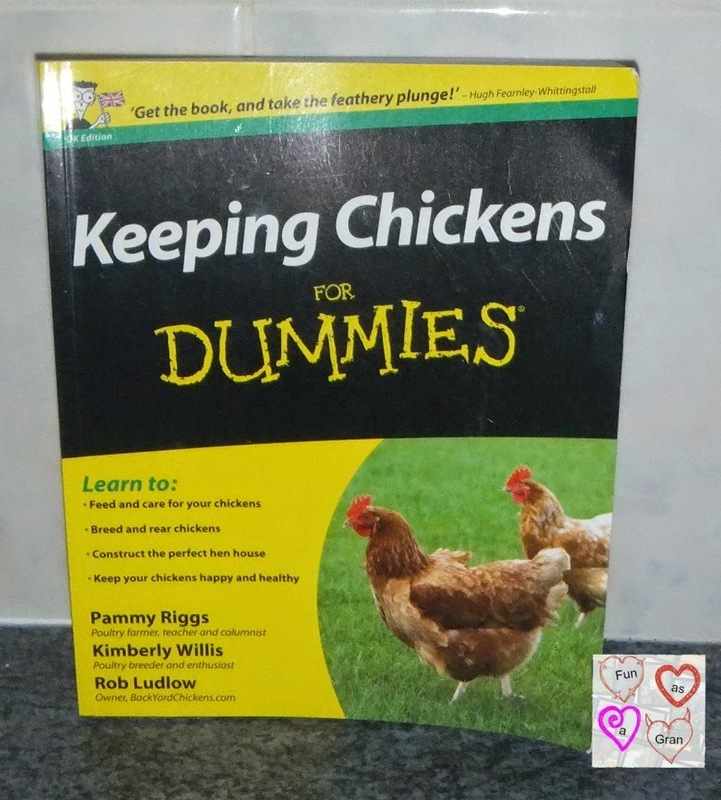 I know what to buy for them next year!! We do not go in for adult Christmas presents in this family in any big way, Christmas is for children. But we always get something small from the children, and Fifi had seen this book whilst out shopping with her mum, and picked it up for me. A lot of useful information in the book. 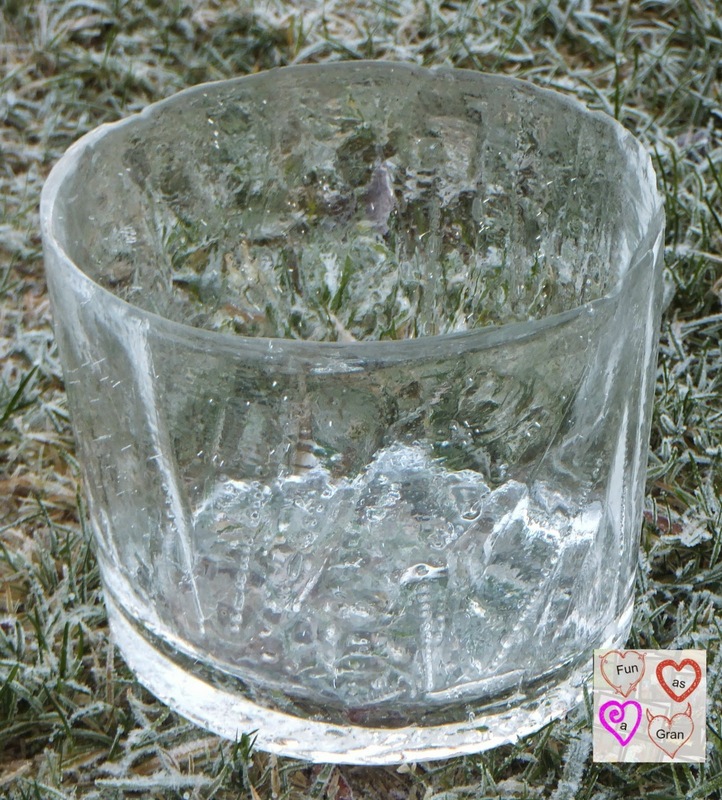 Well we now have frost, much much better than the rain we had at the start of the week. My automatic car defroster kindly gets out of his bed and defrosts the car for me ready for work. This picture was taken at 2pm at the end of my first shift of the day. 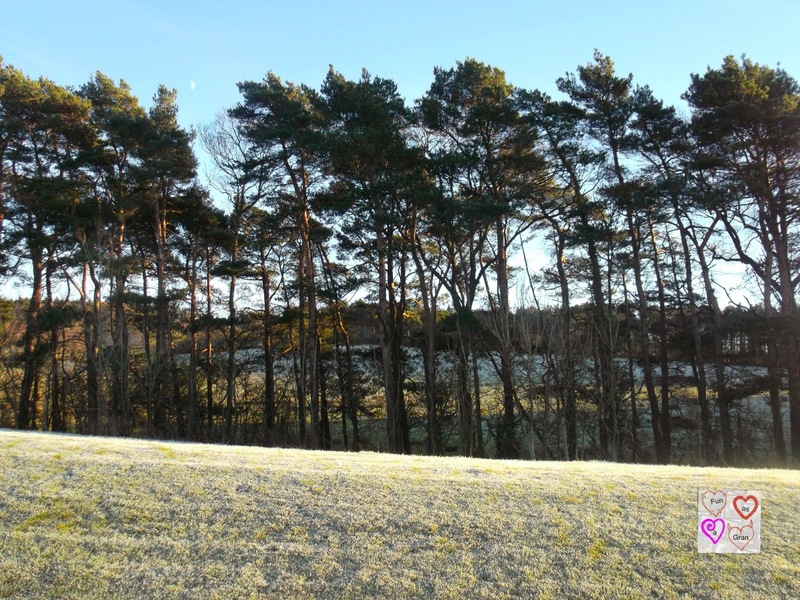 The sun made the trees and grass banking look beautiful, but despite the sun the frost did not clear. The frost has carried on. One of the drawbacks is the chickens water freezes overnight. This was the inside of their bowl when we went out to them in the morning. The dish had frozen right up the edges. The frost is away. Daughter No2 is down for a few days. 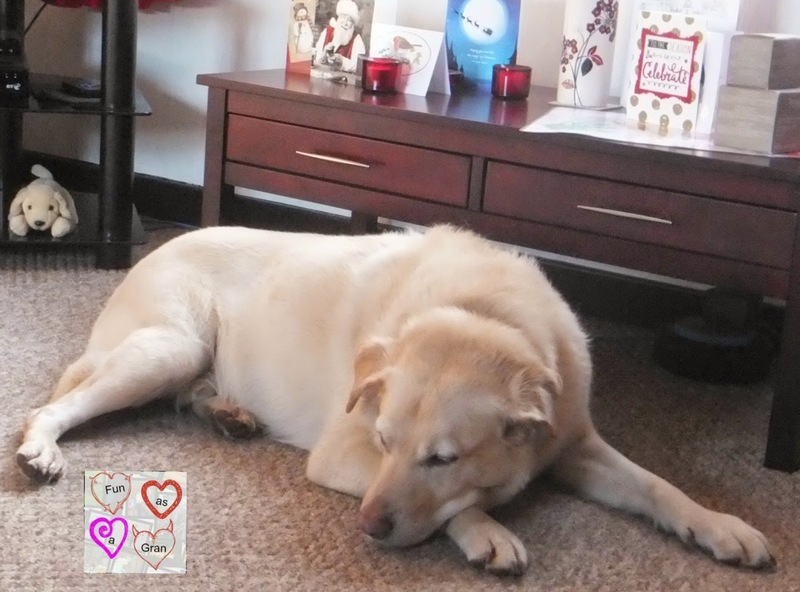 She is off down to see the children and left the dog here while she went. He is waiting patiently on her coming back. I got some money for Christmas and I like to spend this money on me and not swallow it up in the house. So as I had to go into the town to change the children's pyjamas to a bigger size I decided to have a look for one. Did see a couple I liked but decided on a more lightweight one that is wind proof so will do for the spring and autumn as well as now. Well that is it folks, another year finished. A happy, healthy and joyful new year to each and every one of you. I look forward to sharing next year with you. Carrying on the Christmas traditions. All families have them, and they vary from family to family. Some of the traditions we have at Christmas I started with my own children, and have just carried them over to the next generation, others we have started with the grandchildren and will carry them on as long as some of them want to. The tradition we are carrying on that I started with my children is the making of the snacks that get left out for Santa and the elves. This is important to Bob as he makes biscuits for the elves with allergies, and this is an important job. I wonder how many of you know that Prancer has an allergy to carrots, so he much prefers an apple or a parsnip. 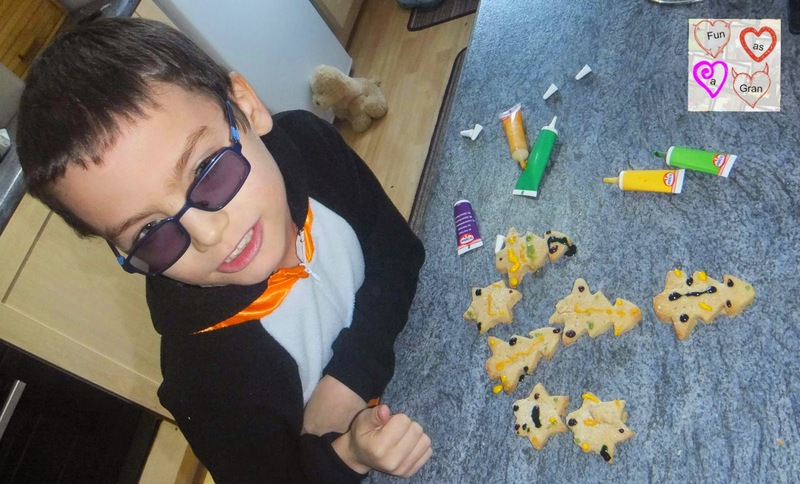 Knowing that the children would be busy on Christmas Eve I had them over on Tuesday evening to make the snacks. They love doing this and would get rather upset if this tradition did not happen. Next year we will have two other little helpers to join in. Can see me still doing this in twenty years time with the next generation as well. This year I found Disney's sing a long a Christmas on you tube and so this gave me an opportunity to share with Bob and Fifi a memory of when their mum and aunts and uncles were children. 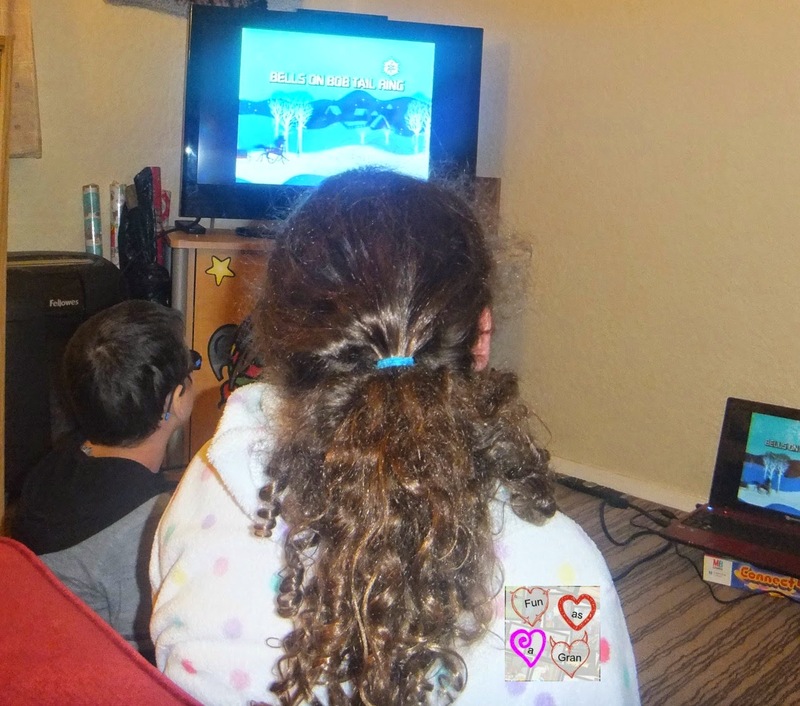 The last part of our Christmas eve was them all watching the video and that heralded bedtime. So we sat and watched it together. Next off is a new tradition, one we started last year with the twins, a foot print made into a picture. I never had much access to the older two when they were young so could not manage to do this sort of thing, but it is lovely to look back on how much they have grown each year. I included all four children in this years as this was about it for crafting for us this year. Our next tradition goes back to 2008, this was when we introduced Christmas No2. to Fifi and Bob. They had moved in with us the previous year when my daughter moved back to Scotland. 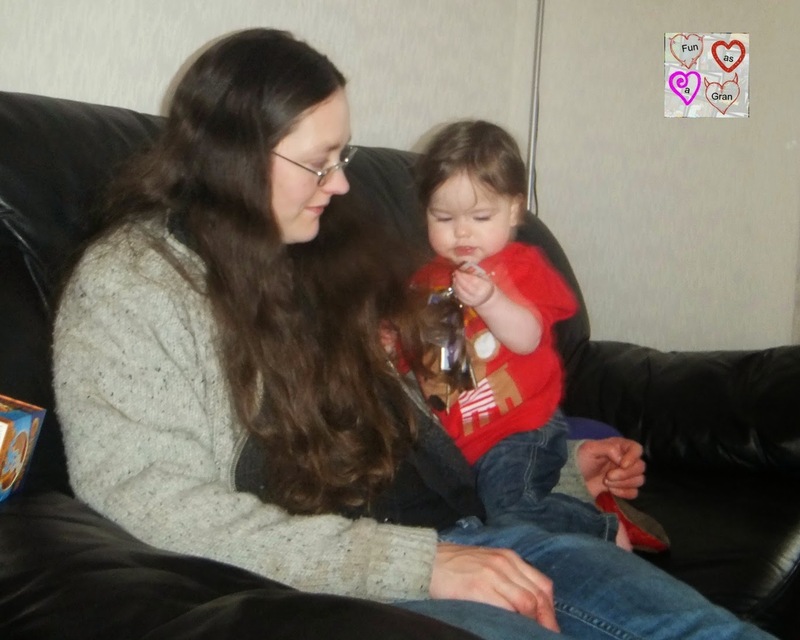 In 2008 she was in her own house and wanted to spend her first Christmas on her own just enjoying the children. We popped in and saw them during the day but decided that we would give them our presents the next day when we would have them over. This spreads the Christmas as well as giving mum and dad a much needed few hours off. But Dinky can be a bit funny and sometimes is great and other times just cries if mum and dad are not here. So we had them all over for Christmas No2. Normally the other daughters come over to spend the day with us but this year they both had to spend time with the other half's families. 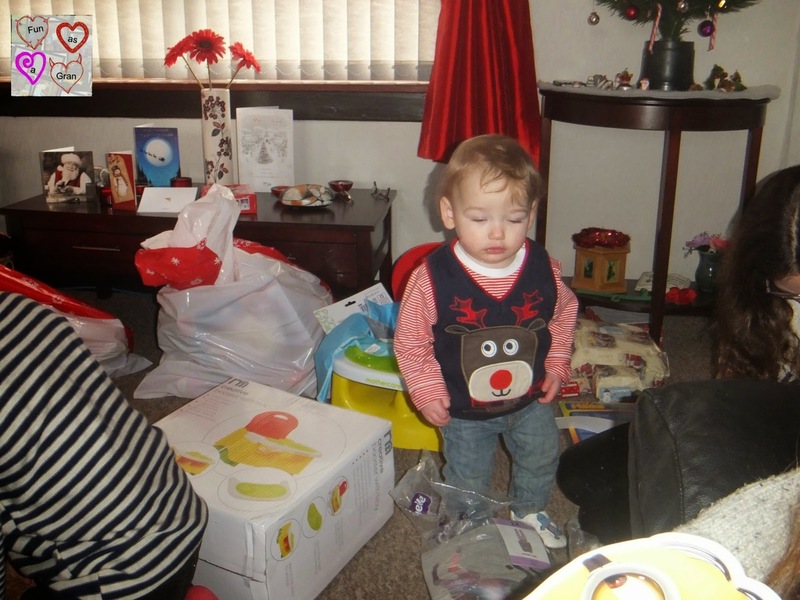 We did not bother to wrap the twins parcels this year as they have not quite got the grasp of unwrapping so theirs are in the four bags along side their chairs. Minky crawls across the train track. and she plays with the car keys as well. So there you have it, traditions old and new, fab times and lovely memories, hope you and yours had as much fun as we did. Festive ways to get fit this winter. 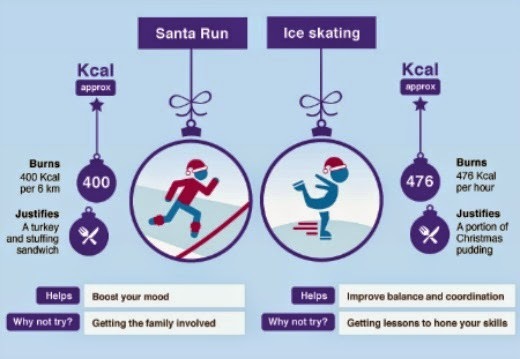 Not many of us count calories over the Christmas period, which is all well and good, but how much fun exercise do we need to balance up the extra calories? We were provided with a skating session in return for sharing this information. Sadly due to family illness we did not get the chance to burn our 486 calories. Maybe next week we can go and burn 170 with a winter walk instead. Research has shown that many people living in the UK are prone to gaining weight during winter 1. This perhaps comes as no surprise to a country that collectively diets every January2. For many, Christmas is a time to indulge. Rich foods fill our cupboards and the cold weather keeps us indoors and sedentary. Consequently, Christmas weight gain becomes hard to avoid. So whilst it's nice to enjoy the season as a 'one-off' time of year, it helps to take some precautionary measures. Cant believe how quick this week has gone, and how little I have achieved The cards are written and distributed, but the wrapping not yet started, and the tree is still in its box. Just don't seem to have had five minutes this week. Did manage to buy the last few bits of presents I needed and hoping to get food shopping on Monday evening. Need to fit in baking with the children as we always make pies for Santa and allergy free biscuits for the elves with allergies. Dinky decided to pop her dish with tatties and gravy in on her head, so I went and helped bath them. Did not manage to get a single picture with both facing the same way. Dinky and Minky having fun. I went off to Morrisons with the two sets of Christmas bonus vouchers I had and did the shopping for the Salvation Army. I had listened to what Avril, the woman who runs their food bank said she needed most and stuck to the ideas she suggested. I did throw in some treats in the line of sweets and biscuits. I have to say I have been really touched by the generosity of the people who have helped me with this collection, over £200 worth of food has been handed in,( and some more has been handed to me today - Saturday) that I will drop off at the start of the week. some of the bags I dropped off. One of the perks of helping at the over 55's club was an invite to go to the pantomime. 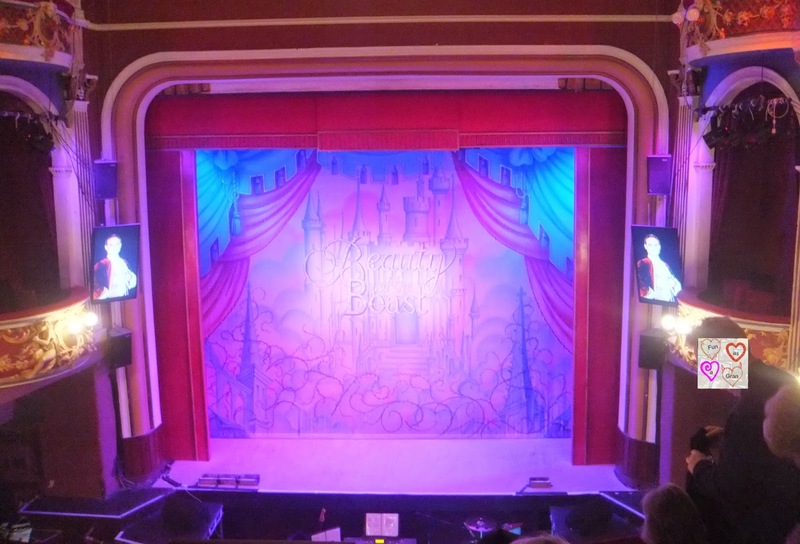 We went to see Beauty and The Beast at the Gaiety Theatre in Ayr. Have to say if you are local I would seriously recommend it, it was amazing, so funny, and the two and a half hours just disappeared. I loved the character Frank, he imo really made the show. Would love to have the money to go back and take the children with me. It did leave me, as a 365'er, itching to take out my camera and use it but we were told at the beginning not to. Took Bob to see Santa at Dobbies in Ayr. Took him last year and it was a amazing. Elf helpers to talk to and take photographs with. 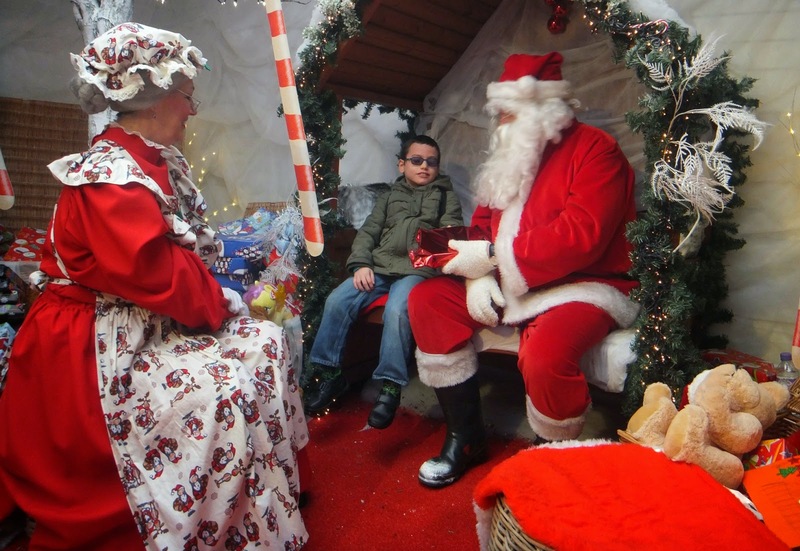 As well as a animated band playing and singing Christmas songs, the atmosphere was amazing. This year I was disappointed, it was lacking that, though we did have a very nice Mrs Claus. Bob told him a list of what he would like, Santa will not have room for that amount of pressies for every child so he may be disappointed. We did pay that we bit extra to get Lego as his pressie at the time as Bob loves Lego. From that point of view it was a good buy as the Lego set would have cost me £10 had I bought it and we paid £10.99 for him to see Santa. Daughter No3 came with us and we met up with Samantha as well. Had the twins for a while after we got back to give mum and dad a break. We popped across to see Son No1 today. The weather here was atrocious. Visibility was virtually zero, the wipers could barely keep the window clear, and then as we headed further east it was warning snow was due. But at least at this point the rain was more normal. This picture does it no justice but the clouds were in front of the hills and it looked quite atmospheric. The plan had been to share the Christmas tree today, but its still in its box, it has made it down the stairs so we are getting there. 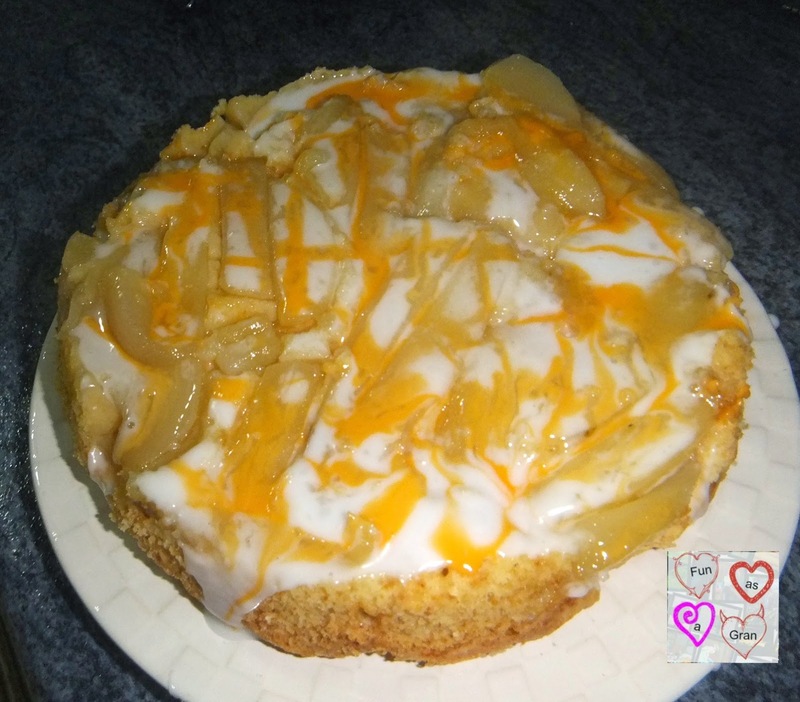 I had pears needing used up so I made a pear upside down cake, and then made some almond favoured icing to put on it, coloured some orange and drizzled it. Looked very pretty here, but five mins later for some reason it had all sunk into the cake and was no longer visible. The other week I had shared with you my three year old £30 slippers. 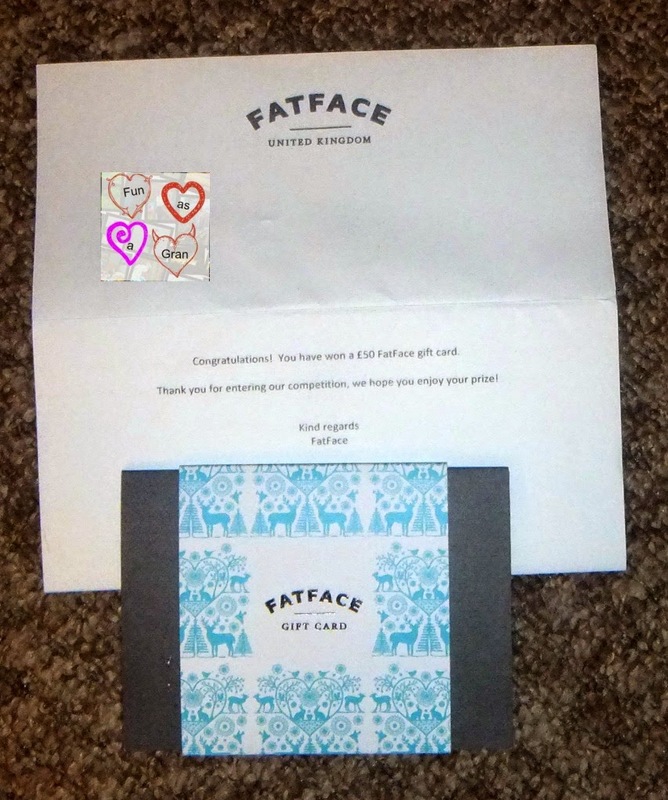 What a coincidence that I should win a competition with them, y prize a £30 voucher. 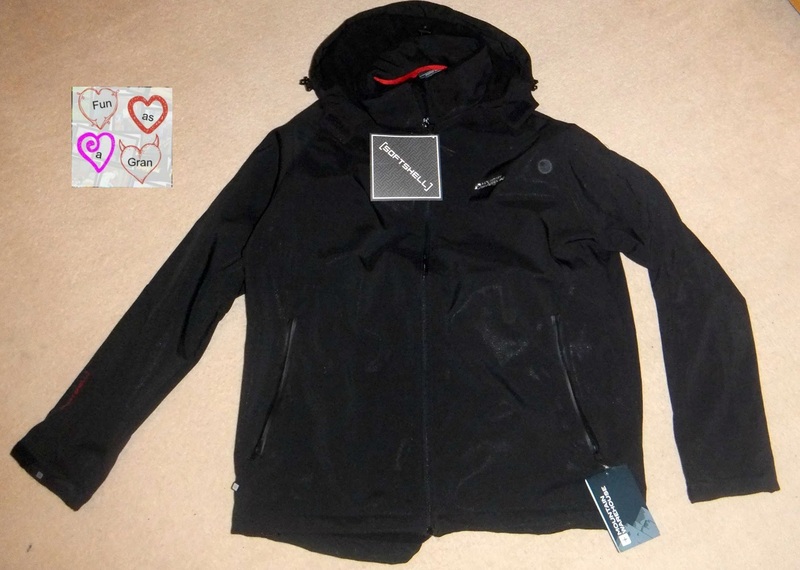 Can't use it online so will need to ask one of the others next time they go to Glasgow to pick me up something, they have a zipped hooded top I like. Feeling a bit better by today. 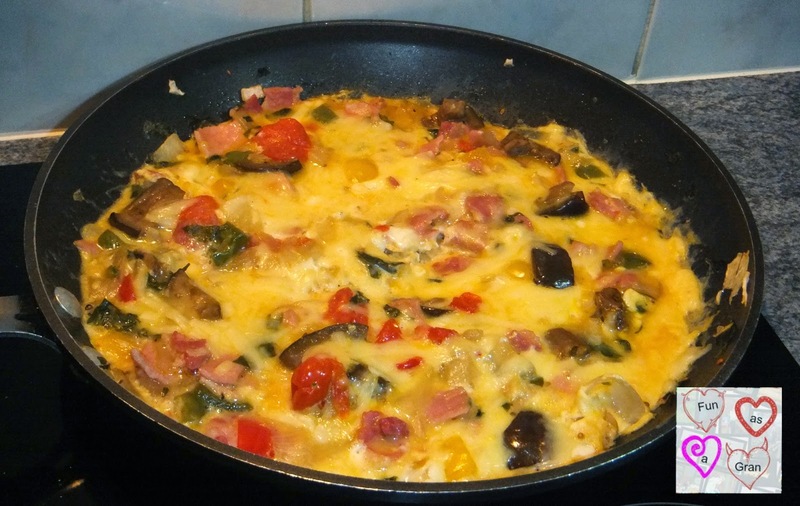 So tonight's tea was an omelette with bacon and various vegetables in. Very nice it was too. Nipped into town today to drop off some toys for the Salvation Army. 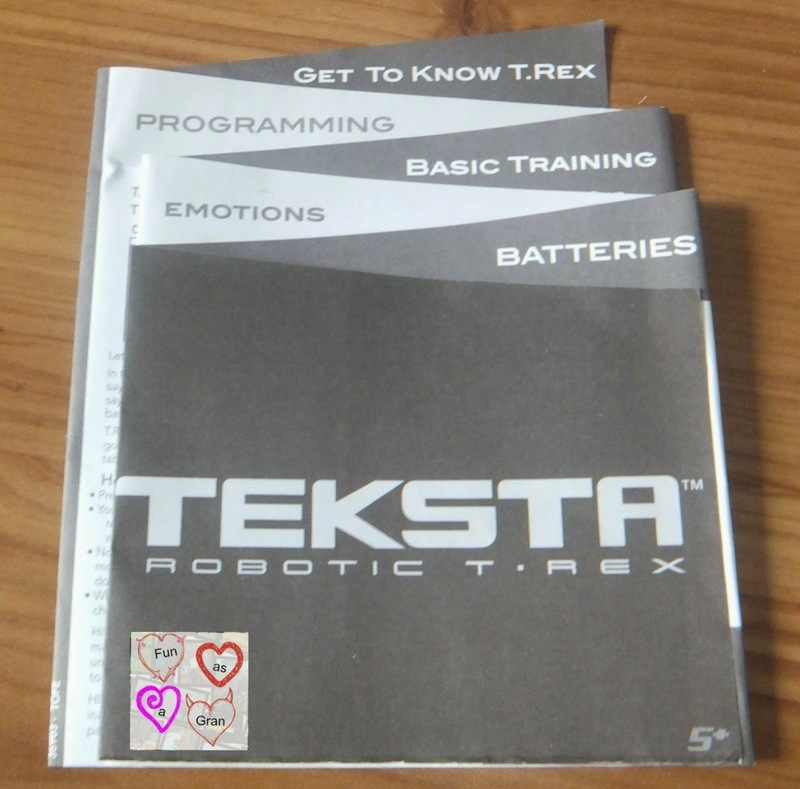 Also dropped off a Teksta T-Rex that I had done a review on during the week as well. I am sure Bob would have loved it but decided some other child would appreciate it more. I do holiday relief cleaning at an complex to cover when their own cleaner if off. 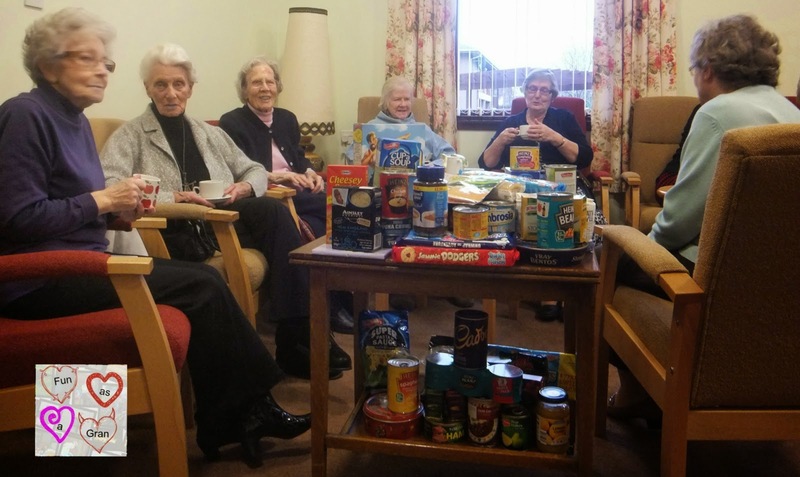 I had asked the other week for permission to pop a box in their lounge for the Salvation Army food bank. They have been amazing, must easily be £50 worth of between biscuits, coffee, tea, sugar as well as beans, meals etc. A fantastic haul. 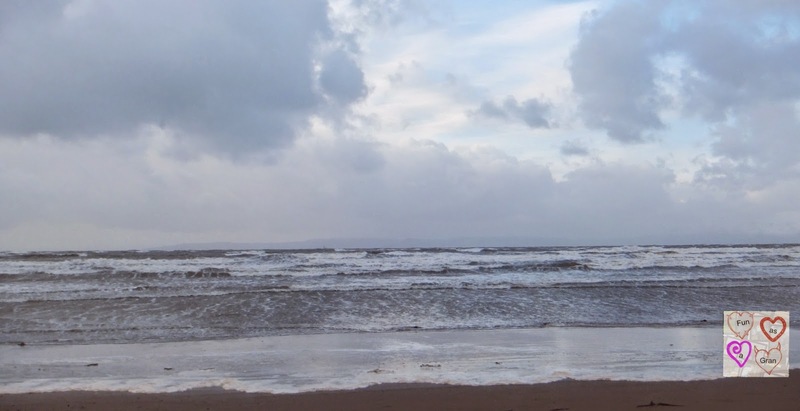 We were warned of a weather bomb that was due to hit us. 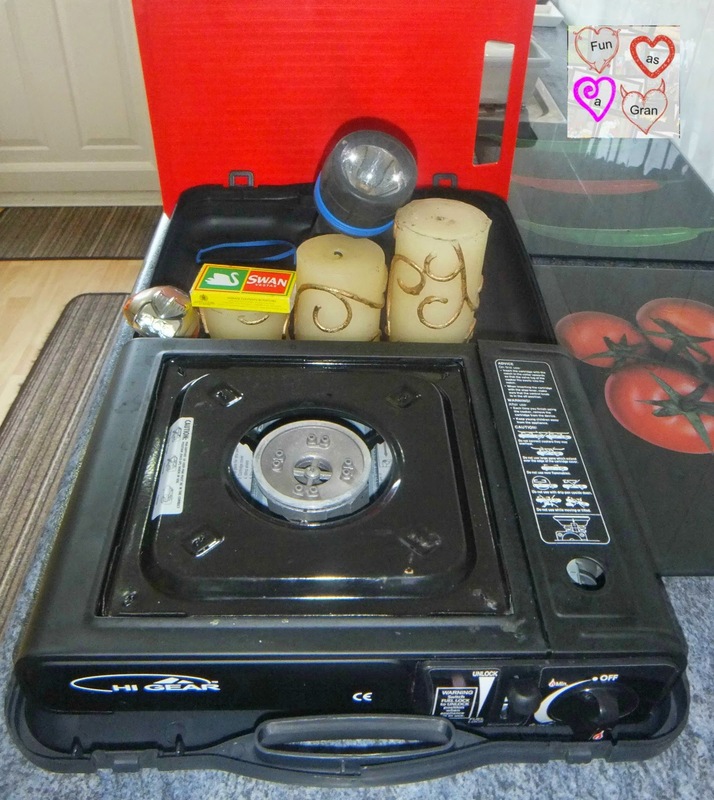 So in anticipation of power cuts we dug out candles, torches and the gas stove. We didn't need them and I have to say for all the weather was wild wet and windy it was no worse than other storms. We saw every conceivable weather going, between rain, sleet, snow, some bits of blue sky and some thunder and lightning thrown in for good measure. I was suppose to be doing holiday relief cleaning at one of the other complexes last week, but with not being well I had had to postpone, and then again yesterday due to the weather. So I made it today, and took a look down the beach to see what damage was done but I have to say I was surprised as there seemed no trace of the storm and no litter blown up on the beach. Had the two over to stay tonight, had hoped to go for a wander round the village and look at the trees and decoration that were up but the wind and snow but a stop to that. Made a cake last night, a normal sponge recipe with half a jar of mincemeat in. 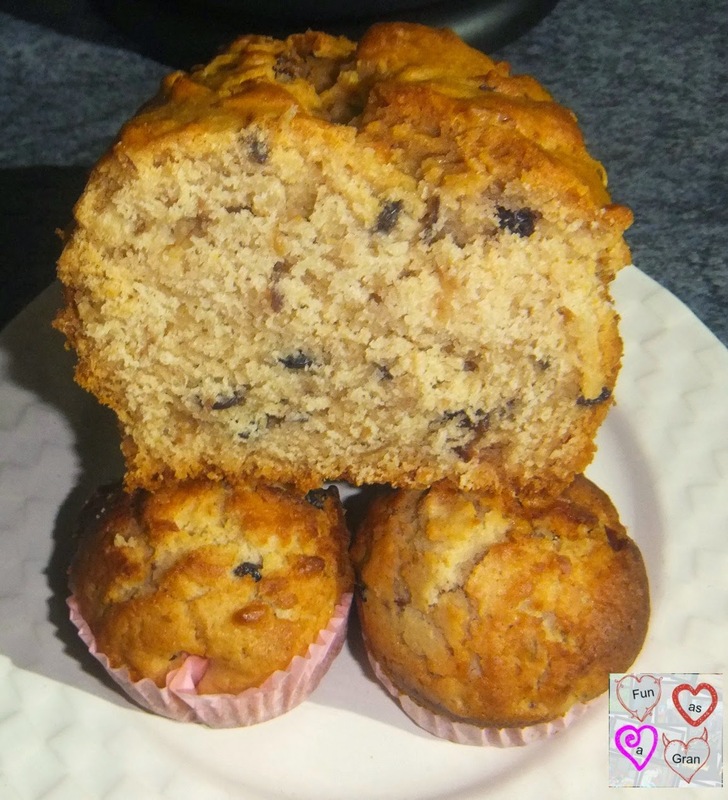 Love this the flavour is amazing with all the spices, the raisins and other fruit are juicy and it changes the colour of the cake. There was slightly too much mixture for just the big tin and so I made four small ones as well. I was approached by UNICEF to join in with the 1 pack = 1 vaccine campaign and as I love to support campaigns like this I readily said yes. 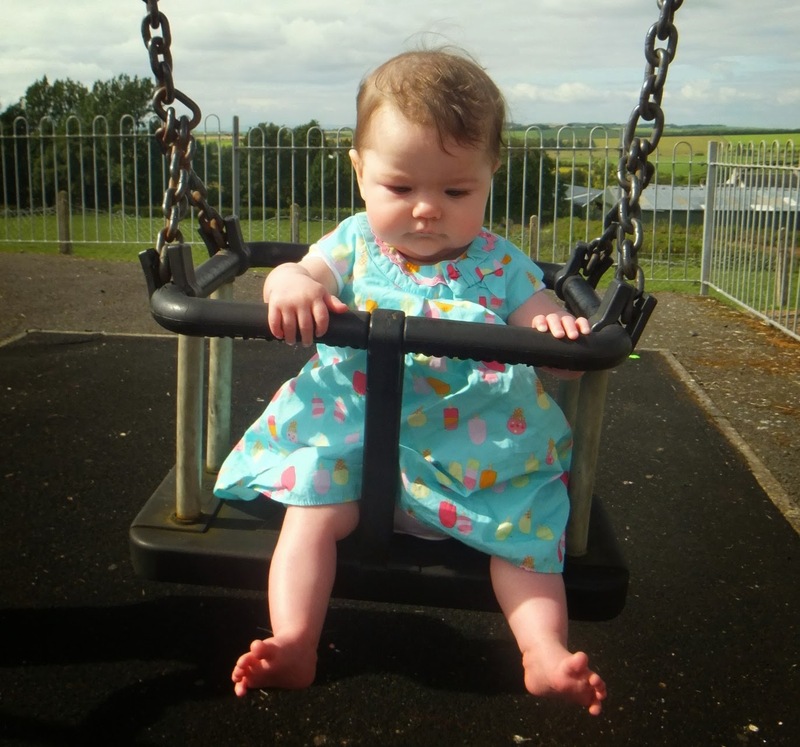 The campaign is working with bloggers who share some "first time moments" on their blog, the moments we treasure as parents and grandparents, the moments that are precious to us. . So what are my firsts? 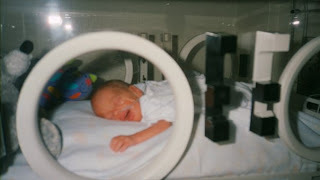 My memories take me back to my first born, born in hospital during a snow storm where half the staff could not get in and the ones that were in could not get home. Fast forward twenty three years and this is my first meeting with my first grandchild, born at 29+6 weighing 3lb 3oz, she is now a happy healthy normal twelve year old. Fast forward another eleven years and her is the first meeting of that first born granddaughter with her brand new twin brother and sister, along with her seven year old brother. This is the twins first day home, meet Minky and Dinky. 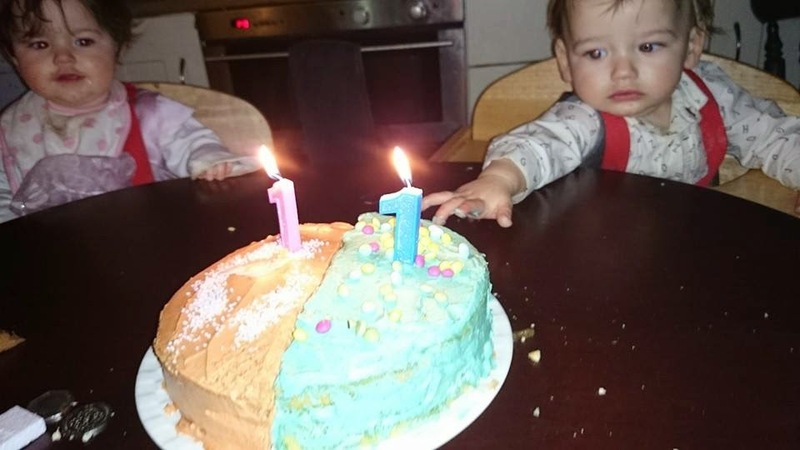 This is their first birthday, complete with the cakes we made for them. 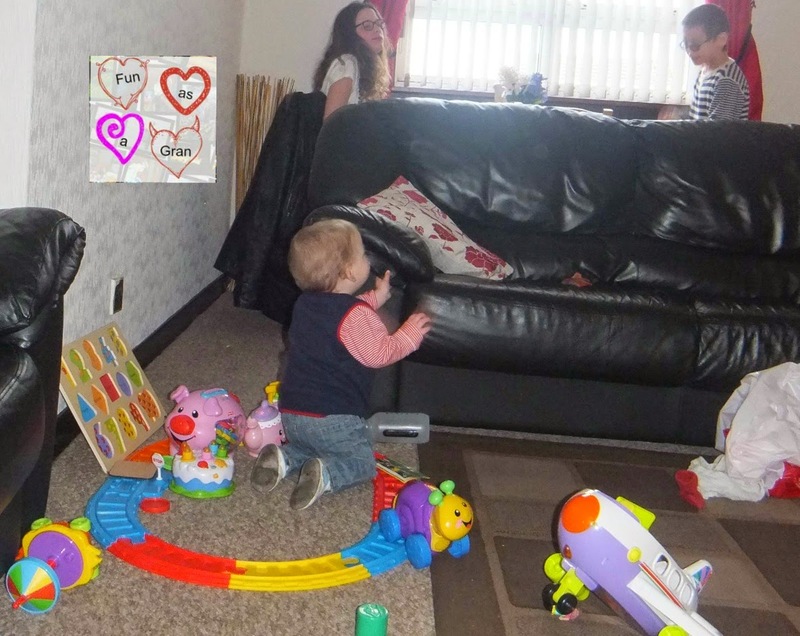 I have to admit I missed a lot of the firsts with the older two because they lived a few hours away, its lovely having them all on the doorstep. The campaign is to highlight the fact that there are millions of babies each year who do not reach their firsts due to the continued danger posed by maternal and newborn tetanus. and eliminating the disease in 15 countries – that’s five more countries since the 2013 campaign! But there are still babies in 24 of the world’s poorest countries at risk. For each specially marked Pampers – UNICEF pack purchased, Pampers will donate for example the cost of one tetanus vaccine to support UNICEF in the fight against maternal & newborn tetanus. Upload to their Facebook page a photo of your baby experiencing their first special moments – whether that’s cuddles, smiles or tastes – and they will donate a third life-saving vaccine. Please a few clicks to help other children worse off that your own has to be worth it. 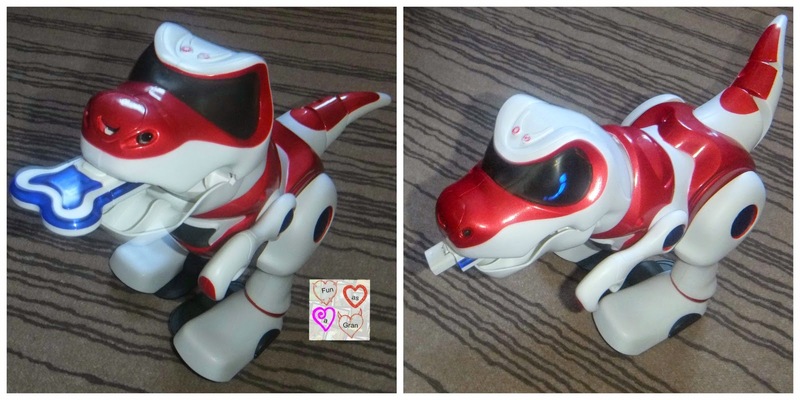 I entered a competition a while ago to win a Texsta T-Rex, but sadly I did not win. But later on I got a lovely e-mail asking me if I would like to review one. I said yes to this opportunity as I knew I could find a good home for the toy once I had done the review. Teksta T-Rex the bone crushing dino! Just like his puppy friend T-Rex responds to your voice, lights and sounds with expressive eye patterns to share his feelings. 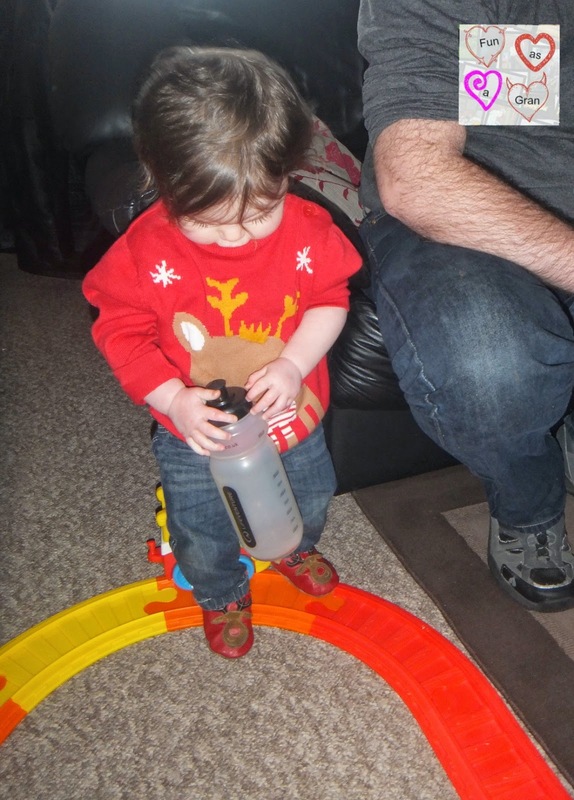 Using cutting edge hand gapproxure technology command Teksta T-Rex to walk, move his hands, tail and stop. Stroke his face to hear him roar and see him snap just like a real T-Rex Dinosaur. When he's hungry feed him with his dino bone to see his ultimate trick, watch him crunch, munch and launch it away, followed by an almighty burp! 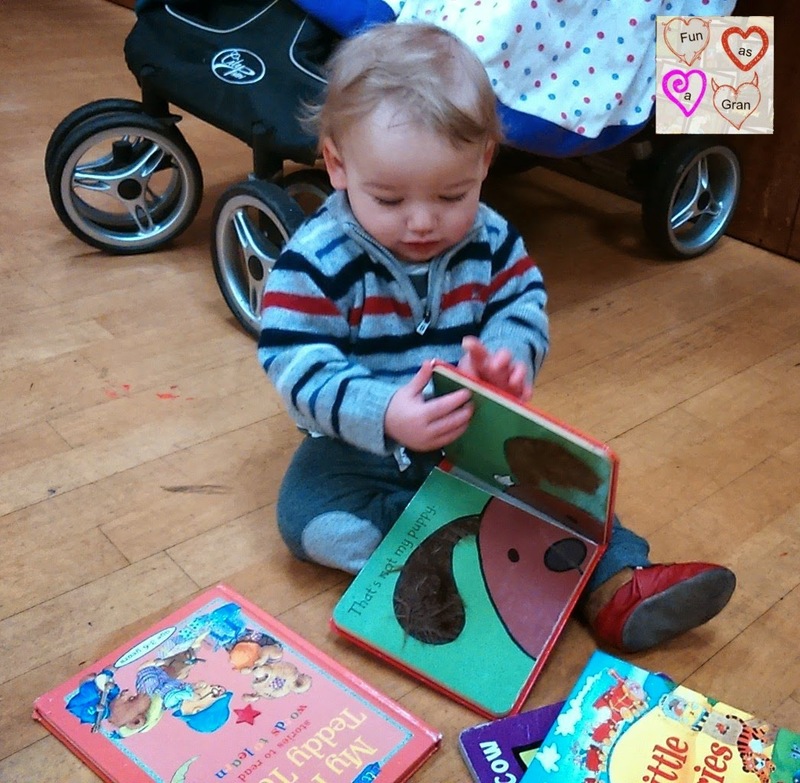 With over 100 physical and app-sized interactive play features. Includes bone accessory. For ages 5 and over. Requires 4 x AA batteries (not included). So when he arrived, the day after I had joined in a twitter conversation on how difficult some toys are to remove from their packaging, but have to say a few snips of the string and this was easy. ( I did not cut the string as I was putting this back in the box to pass on). He takes two AA batteries in the bottom of each foot ( batteries not included). The first thing that impressed me was how few user instructions there were, the fold out leaflet had all the information you needed to use him, no complicated umpteen paged handbook to put young children off. He would also require no presetting up so apart from adding batteries he is use able straight from the box. He switches on with a simple push button on his chest, and as you switch him on he roars and his eyes light up. 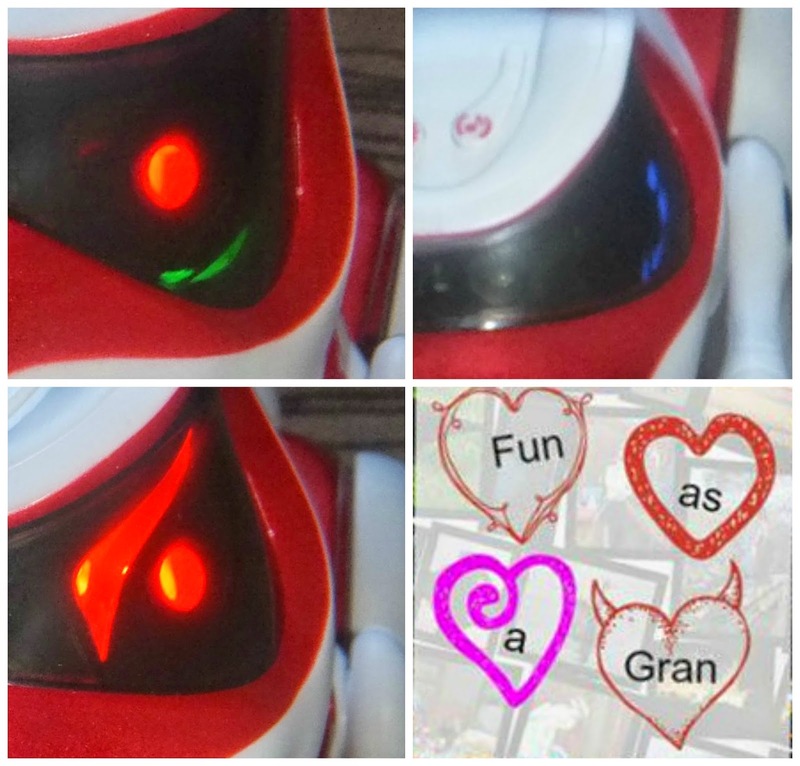 His eyes light up with different sequences depending on what you are expecting him to do. He has two different mode buttons on top of his head,the one on the right makes him sing and dance, the other button allows you to talk to him, he listens and then talks back to you. You can further expand on what the toy can do if you have an i-pad or an Android tablet. Go to the appropriate online store and download the free app, then by pressing the left hand button on his head you can get him to intereact with you. So many children have tablets these days this app will add to the fun and usability of the toy. This kept four adults amused last week seeing what we could get him to do. The app was easy to use. If you do not have a tablet or i-pad there is still a lot of play value in this toy. He comes complete with his own bone, that if placed in his mouth will be snapped in half, "eaten" and the thrown out of his mouth, followed by a very loud burb - which children seem to find very funny. I did not let the children near the review of Dino as I knew Bob would love him. 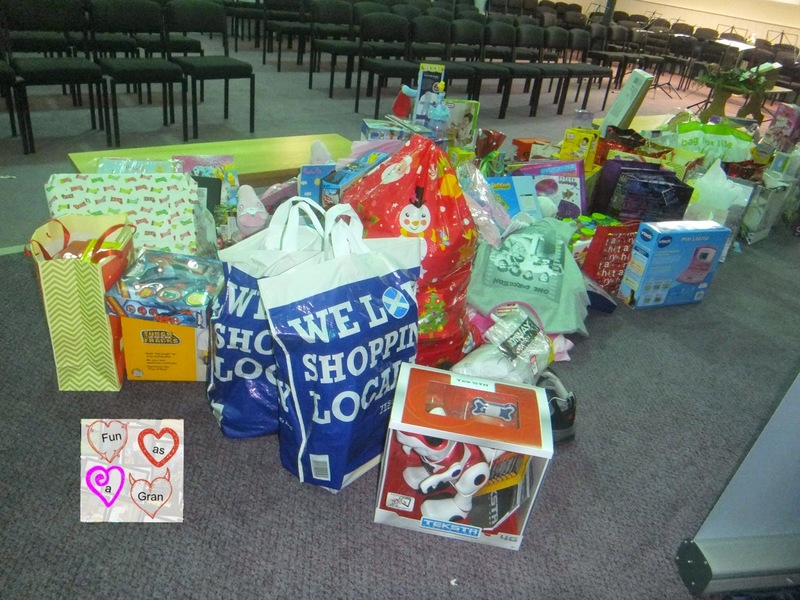 But Dino is away to a new home, he was handed into the Salvation Army, along with two carrier bags of other toys, jigsaws, and "smellies" to be added to other donations to be given to local children who may not get much else. I repacked him neatly so it is not obvious he has been out and added a pack of batteries in with him so there were no tears on Christmas morning because somebody could not use him. Dino was added to the other donations. 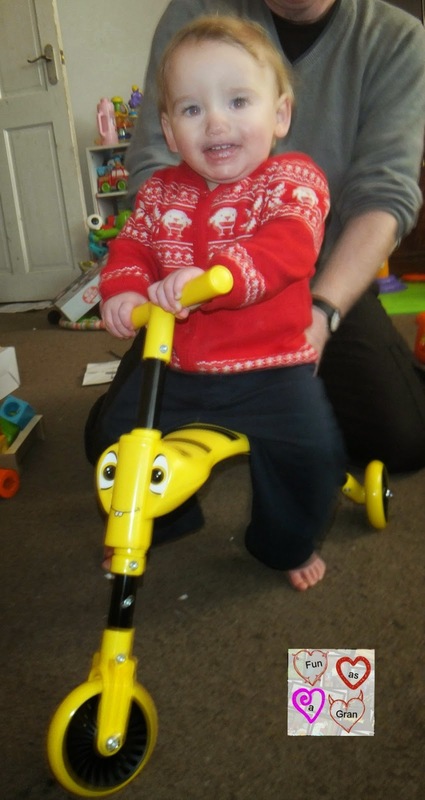 Overall opinion - I am sure that child will have a lot of fun as the toy is fun and interactive with a lot of play appeal. I would recommend for the five to eight year age group.